Age-related macular degeneration (AMD) is characterized by the accumulation of drusen at the junction of retinal pigment epithelium (RPE) and Bruch's membrane (nonexudative or "dry" AMD) and, in some cases, choroidal neovascularization through Bruch's membrane (exudative or "wet" AMD). While approximately 15% of patients with AMD have the wet form of the disease, which may cause relatively rapid and severe vision loss, wet AMD is responsible for over 80% of legal blindness due to AMD.1 Patients may suffer severe degeneration of RPE and photoreceptor cells, and develop the severe form of dry AMD, geographic atrophy. C-reactive protein (CRP) is an inflammatory protein produced in the liver, and its serum levels have been demonstrated to rise significantly from near 0 mg/L to above 10 mg/L during periods of systemic inflammation. With the hypothesis that chronic inflammation is related to AMD, numerous studies have been conducted to study the correlation between CRP level and the progression of AMD. CRP activates the classical complement pathway by binding to phosphocholine expressed on the surface of dead cells, bacteria, and fungi on one side of the CRP molecule, and binding to the heads of C1q molecules on the other side of the CRP molecule (Figure 1).8, 10 This promotes the clearance of foreign cells and cellular debris by forming membrane attack complexes and attracting phagocytes. It has been hypothesized that an elevated level of CRP may serve as a biomarker of AMD because an amplified CRP level suggests inflammation. Figure 1. Pentagonal planar CRP molecule binds to phosphocholine groups of the phospholipid membrane. 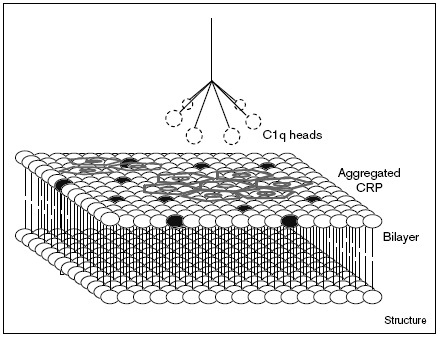 The other face of CRP reveals C1q recognition sites. Image source: Thompson, et al. The physiological structure of human C-reactive protein and its complex with phosphocholine. Structure, 1999. 7(2): p. 174. The high-sensitivity CRP test (hs-CRP) can measure CRP levels below 10.0 mg/L in the serum accurately and at a low cost.11 Therefore, hs-CRP is a practical tool for assessing inflammation that is difficult to observe. Hs-CRP is currently used in some clinics as a biomarker for one's risk for cardiovascular disease, and it has been suggested that cardiovascular disease and AMD share numerous risk factors, including smoking and obesity.12 There have been multiple cross-sectional studies to evaluate the correlation between CRP levels and AMD severity. These studies produced mixed results; some studies found CRP significantly associated with AMD severity whereas others did not.4 On a similar note, inconsistencies are present in the studies that have reported a statistically significant association. For example, a case-control study in 2004 by Seddon et al. divided the patients (n=935) into four groups (183 no maculopathy, 200 mild, 325 intermediate, 222 geographic atrophy or wet AMD) based on the severity of AMD measured by the size of drusen and the incidence of choroidal neovascularization. A significant association between CRP and AMD severity was found (P=0.02), with the median CRP values of group 1 (no maculopathy) and group 4 (advanced AMD) being 2.7 and 3.4 mg/L, respectively.13 It is noteworthy that the four maculopathy groups have CRP ranges of 0.2-39.4, 0.2-41.8, 0.2-110.0 and 0.3-117.0 mg/L and interquartile ranges of 1.2-6.5, 1.2-5.5, 1.2-5.7 and 1.7-7.7 mg/L, respectively. The medians of group 1 and group 4 differ only slightly, and the interquartile ranges of the four groups are similar. These findings suggest that CRP alone as a biomarker of AMD may be misleading despite the significant correlation in many studies. Figure 2. CRP binds to CFH at SCR 7-11. The arrow indicates the location of Y402H polymorphism. The binding sites for C3b are specified. Image source: Laine, M., et al., Y402H polymorphism of complement factor H affects binding affinity to C-reactive protein. J Immunol, 2007. 178(6): p. 3834. While it has been shown that individuals with the Y402H polymorphism and high CRP levels are more susceptible to developing advanced AMD, the biomolecular significance of the hindered attraction between CFH and CRP is unclear. It is possible that age-related changes to glycosaminoglycan structures, as observed in other tissues, contribute to reduced binding with Y402H CFH by increasing the susceptibility of the retina to autoimmune processes. It has been hypothesized that with age, CFH-CRP driven non-inflammatory clearance of cellular debris becomes less effective, and the presence of drusen signals for more immune related proteins, contributing to protein aggregation and drusen formation; and that the mutation in the SCR 7 region of CFH decreases the protection of the aged retina from immune responses and causes chronic inflammation. Further studies regarding the reduced attraction of Y402H CFH and CRP and its immunogenic consequences may explain the association between AMD and CRP level in Y402H carriers. As described, CRP is not only a biomarker of inflammation but may also participate in the AMD disease process. Currently, exudative AMD is treated with anti-VEGF therapies. The nonexudative form does not have a proven treatment, although nutritional supplements such as antioxidants have shown to slow down the progression of the disease and reduce the risk of developing the exudative form of the disease. With regards to the inflammatory aspect of AMD, there are ongoing studies to investigate treatments targeting the complement pathway.14 With future advancements in understanding the role of inflammation in the etiology of AMD, we look forward to the development of methods to identify at-risk individuals and medications that may prevent AMD. Reference(s): 1. Sunness, J.S., The natural history of geographic atrophy, the advanced atrophic form of age-related macular degeneration. Mol Vis, 1999. 5: p. 25. 2. Klein, R., et al., Inflammation, complement factor h, and age-related macular degeneration: the Multi-ethnic Study of Atherosclerosis. Ophthalmology, 2008. 115(10): p. 1742-9. 3. Hageman, G.S., et al., An integrated hypothesis that considers drusen as biomarkers of immune-mediated processes at the RPE-Bruch's membrane interface in aging and age-related macular degeneration. Prog Retin Eye Res, 2001. 20(6): p. 705-32. 4. Robman, L., et al., C-reactive protein levels and complement factor H polymorphism interaction in age-related macular degeneration and its progression. Ophthalmology, 2010. 117(10): p. 1982-8. 5. Clark, S.J., P.N. Bishop, and A.J. Day, Complement factor H and age-related macular degeneration: the role of glycosaminoglycan recognition in disease pathology. Biochem Soc Trans, 201038(5): p. 1342-8. 6. Johnson, P.T., et al., Individuals homozygous for the age-related macular degeneration risk-conferring variant of complement factor H have elevated levels of CRP in the choroid. Proc Natl Acad Sci USA, 2006. 103(46): p. 17456-61. 7. Kanda, A., G. Abecasis, and A. Swaroop, Inflammation in the pathogenesis of age-related macular degeneration. Br J Ophthalmol, 2008. 92(4): p. 448-50. 8. Laine, M., et al., Y402H polymorphism of complement factor H affects binding affinity to C-reactive protein. J Immunol, 2007. 178(6): p. 3831-6. 9. Perkins, S.J., A.I. Okemefuna, and R.D. 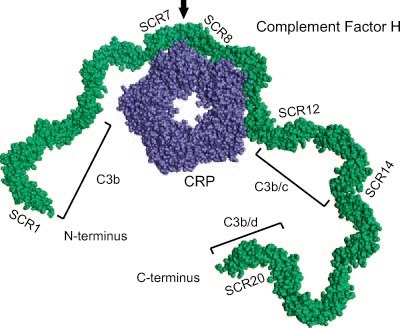 Nan, Unravelling protein-protein interactions between complement factor H and C-reactive protein using a multidisciplinary strategy. Biochemical Society Transactions, 2010. 38: p. 894-900. 10. Thompson, D., M.B. Pepys, and S.P. Wood, The physiological structure of human C-reactive protein and its complex with phosphocholine. Structure, 1999. 7(2): p. 169-77. 11. Roh, E.J., et al., A useful predictor of early atherosclerosis in obese children: serum high-sensitivity C-reactive protein. J Korean Med Sci, 2007. 22(2): p. 192-7. 12. Seddon, J.M., et al., C-reactive protein and homocysteine are associated with dietary and behavioral risk factors for age-related macular degeneration. Nutrition, 2006. 22(4): p. 441-3. 13. Seddon, J.M., et al., Association between C-reactive protein and age-related macular degeneration. Jama-Journal of the American Medical Association, 2004. 291(6): p. 704-710. 14. Miller, J.W., Treatment of age-related macular degeneration: beyond VEGF. Jpn J Ophthalmol. 54(6): p. 523-8.